Completely CASEd this one from Diana, loved the design so much I didn't change a thing. That rarely happens. 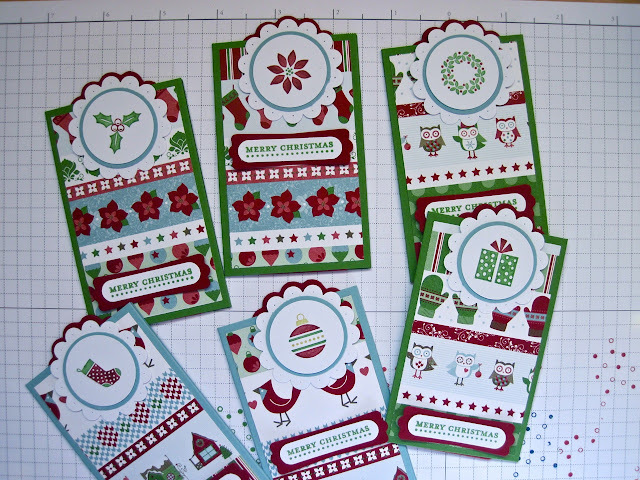 I LOVE the new Gingham Garden DSPs and the Label Love stamps are growing on me. This just seemed like the perfect card to showcase both. And who doesn't love those little flowers! This card is feminine without being girly, which is perfect for the friend who I sent it to. 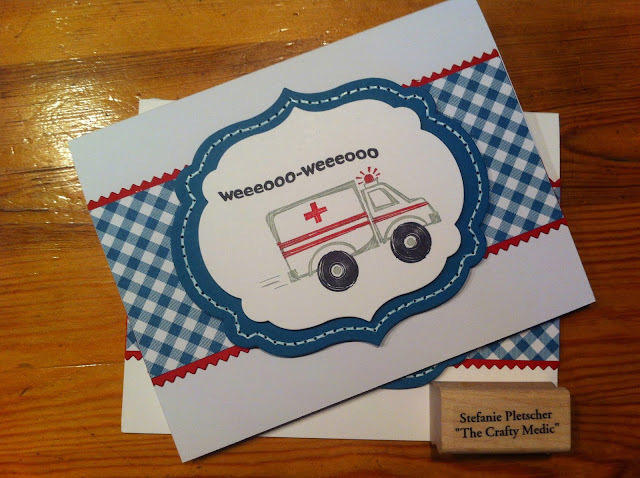 I needed a quick thank you card for a new customer, this sentiment seemed perfect! I love this hostess set from last years catalogue, it's one I don't know I could part with (but I do have it for sale in my retired stuff). 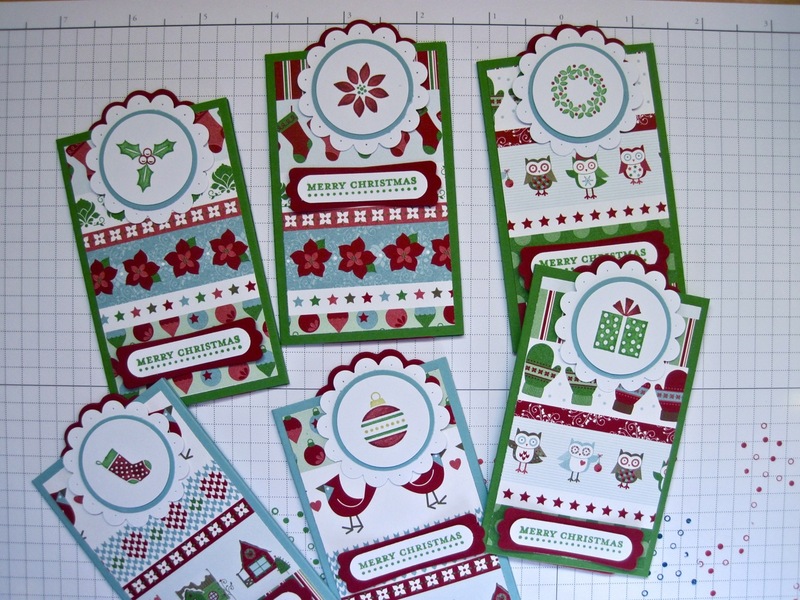 The DSP is from the Festival of Prints stack from the 2012 Holiday Catalogue, a great pack of general and Christmas-ey patterns I wish we could have kept! Luckily I have a lot of it! Another card from You're My Hero. 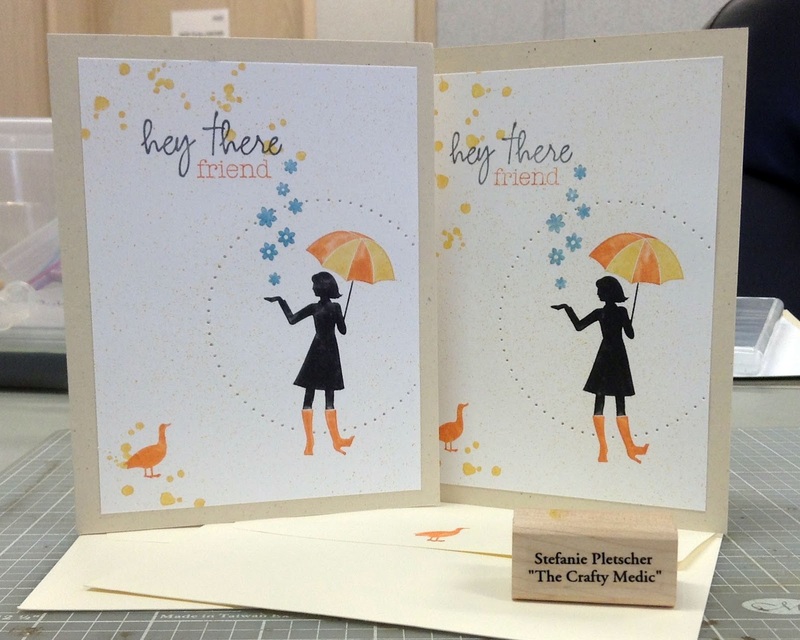 I love this set, it's so perfect for so many of my friends, and I might even start making more cards for my coworkers. The coredinations card stock and some retired DSP make this card I think, they really make the flower trim (also retired unfortunately) pop. I dyed them with an ink pad and alcohol to make them match the color scheme. I did a lot of sponging on this one, and spent a lot of time watercoloring the roses, which was totally worth it. I saw a cute wedding card in the new catalogue (page 72 if you have one and want to see), and didn't really think much of it. But then I needed to make a card for some friends that got married, and gave it a shot! 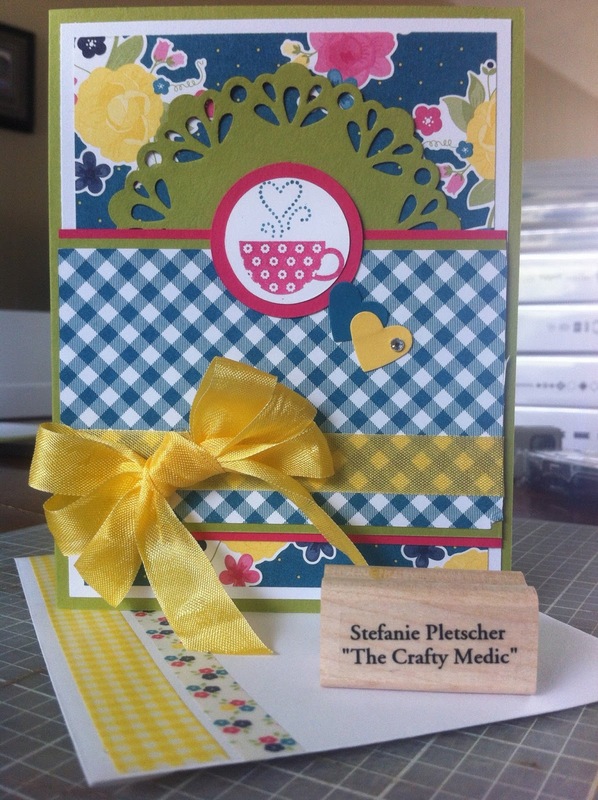 I decided to use some of the new In Colours along with the "Mosaic Madness" stamp set and matching punch. First I folded and cut my Baked Brown Sugar card stock to make a base (I think the finished size of 5.5"x5.5", bigger than the one in the catalogue). I layered a piece of Whisper White on top of it. I stamped the mosaic piece with Crisp Cantaloupe and Pistachio Pudding then punched them out. 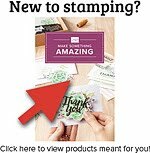 I used Stampin Dimensionals to pop them up on the base, then filled it the gaps with Baked Brown Sugar and a smaller stamp. 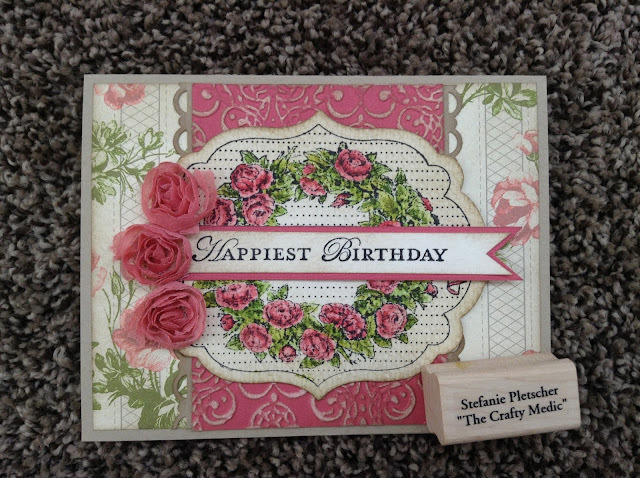 The sentiment was stamped and then punched out (using the technique shown in the catalogue) with the ticket builder punch. A strip of Baked Brown Sugar and the card front was basically done! I did bling it up a little with the smallest of the pearl embellishments inside the small pattern. I kept the inside simple, adding the other half of the sentiment and two pattern strips from "Mosaic Madness. The sentiments are from "Petite Pairs", one of my favourite stamp sets, which are actually on sale for 25% off until the end of the month! Yet another bunch of cards! Another post of all kinds of random cards I've been making. 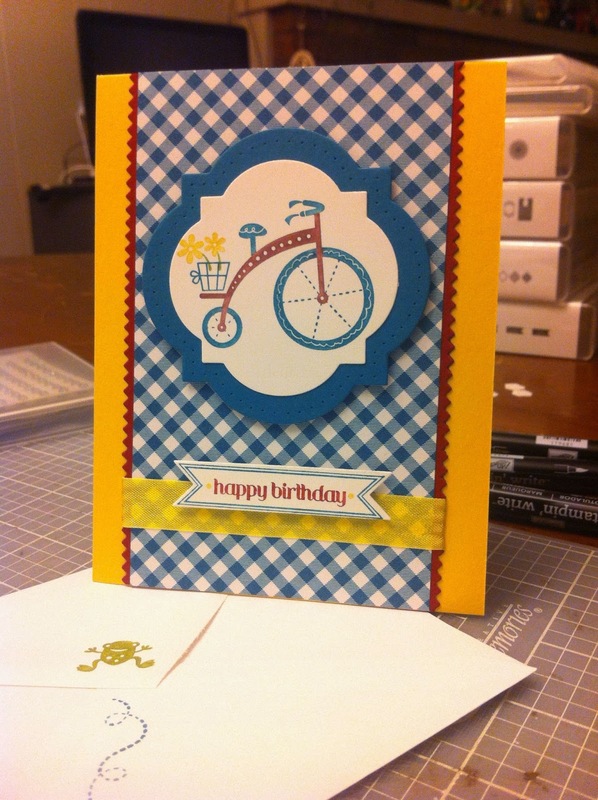 The first is a card I made at work, I actually made several of them with different sentiments. This next card shows off some new (and old) favorites. The DSP is from the new 'Gingham Garden' suite. I used the stamp from Sale-a-Bration's 'Patterned Occasions'. 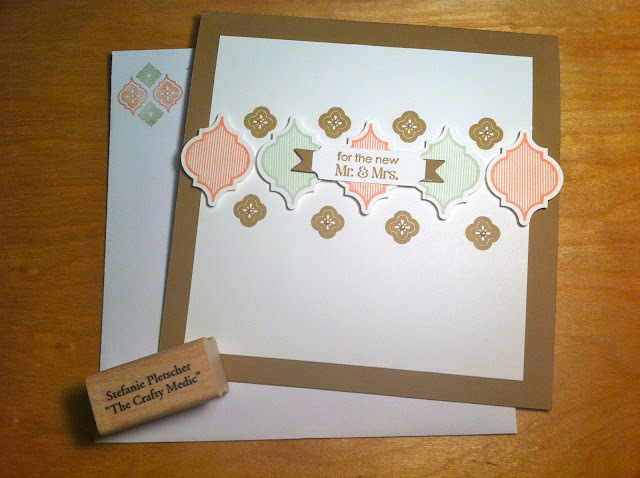 Add some ribbon and bling and this cute card (and it's washi taped envelope) was on it's way to it's new owner! This card was made for a very special little boy who's turning two this week! I haven't used the 'Movin Forward' set or the edgelits very much, so this was a great chance to break out both! Then I borrowed from that design to make this card! This one would work for kids too, but it's actually headed to some adults I know. Well as much as paramedics are ever adults... I love this set, there's also a couple more sentiments (including "you're my hero! 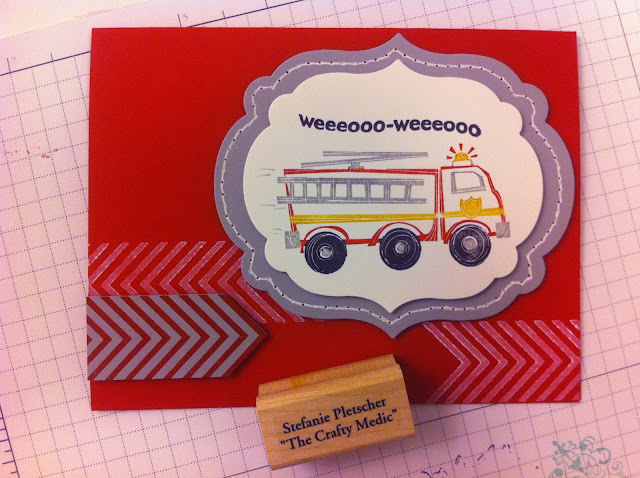 "), a fire truck, and a police car. With the people in my life, this set will get a lot of use! My dad's birthday is the same weekend as Father's Day, so I had to make something special. 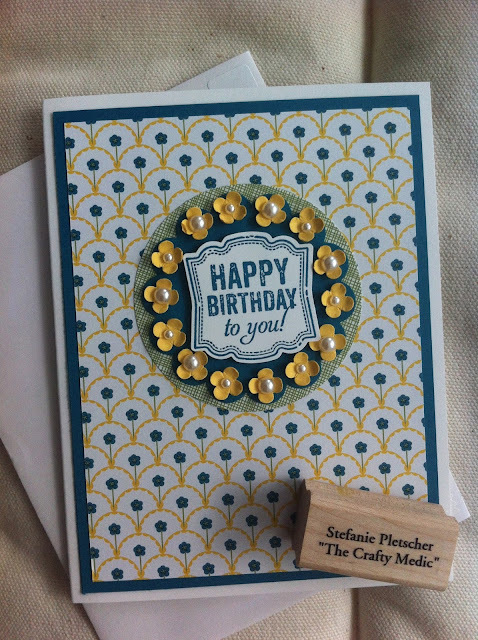 He can be quite difficult but I'd seen this card on Carolyn King's blog, and knew I had to CASE it. I don't think I've ever spent this much time and effort on a card, but it was totally worth it! 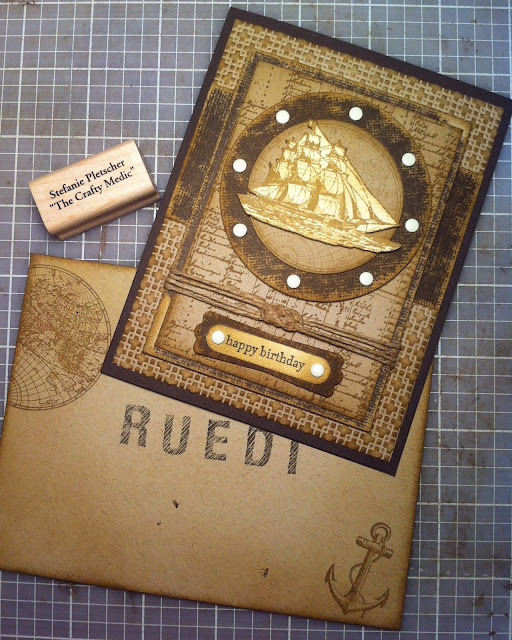 First I stamped the map and anchor images from "Open Seas" onto a Crumb Cake envelope in Baked Brown Sugar (one of the new In Colours). I also sponged the edges of the envelope (you can't see it, but I sponged the flap on the back and stamped it with the compass image too). 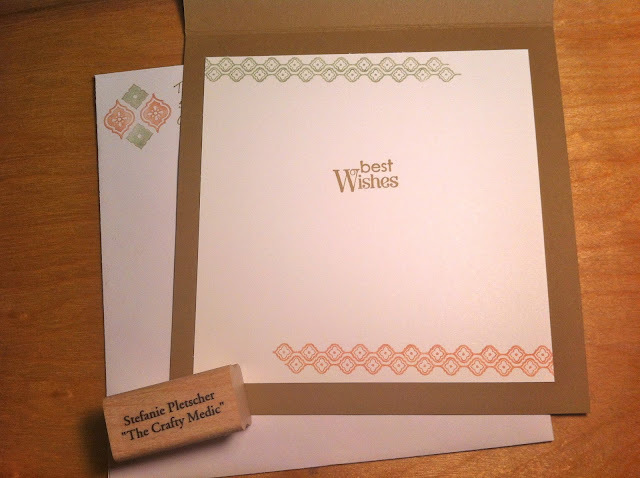 I used Early Espresso and the new "ABC-123 Sketch Alphabet & Numbers" to stamp my dad's name onto the envelope too. I LOVE how easy it is to use these letters to spell something out. I have yet to try them out with the matching outlines, but that's coming up soon! After the envelope was done, I cut three pieces of Early Espresso Coredinations (which is now available in all colours), sanded them with a Stampin' Sanding block and then sponged them with some more Baked Brown Sugar. I also sponged my pieces of crumb cake after using the Square Lattice Embossing Folder on one and stamping the ships log image on another. The map was stamped off and then stamped on another piece of Crumb Cake that I cut out with a circle tool (I could have just as easily used the Circle Framelits, but didn't have them with me). Everything got it's edges sponged! The sentiment was stamped on Very Vanilla (it's from Teeny Tiny Wishes, one of my most used sets). Then I layered by punching the Word Window and then the Modern Label (more Coredinations!). I stamped the ship in Baked Brown Sugar on Very Vanilla and then fussy cut it out. I used some retired hemp string to tie a knot (instructions here). My dad's big into knots, so it had to be perfect! I attached the knot to the two pieces I layered, then used Stampin' Dimensionals to pop it up over the other layers. The circles got popped up, then the ship on top of that. I used the fabulous new Candy Dots in Very Vanilla as accents on the 'port hole' circles and sentiment as a finishing touch and the front was done! 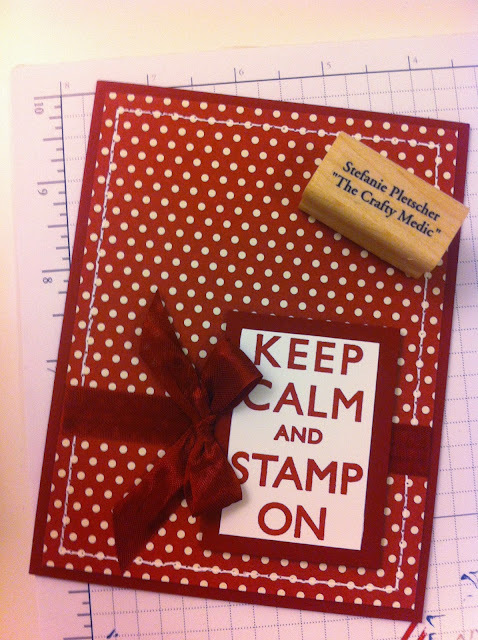 I kept the inside relatively simple, all the stamping was done in Baked Brown Sugar, and both layers were sponged. 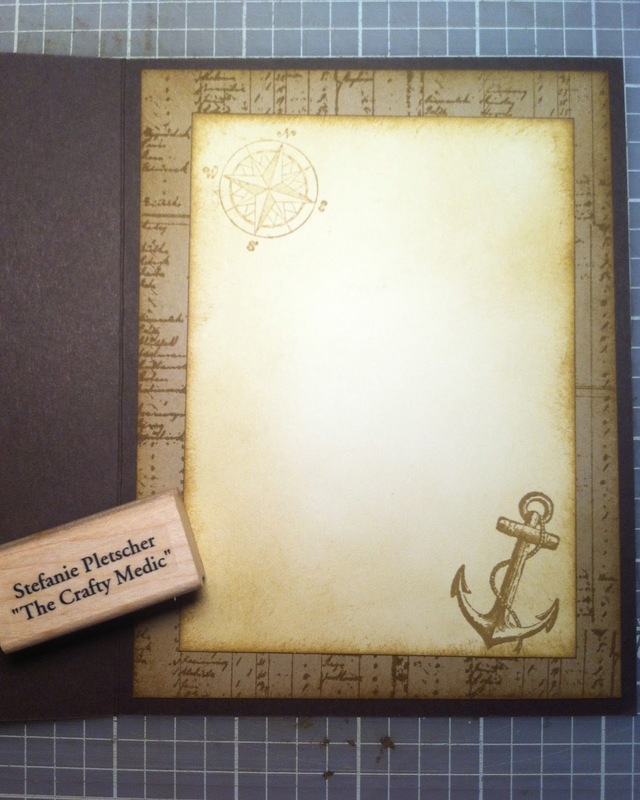 I stamped off the compass image before stamping it, but the anchor was at full strength. There you have it! All the supplies I mentioned above (except the string, but linen thread would be similar) are available for purchase through my online store. 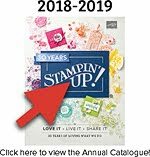 Today is the last day to buy retiring product (check out the online store to see what's still available), and I'm able to sell my used retired stamp sets and accessories now. 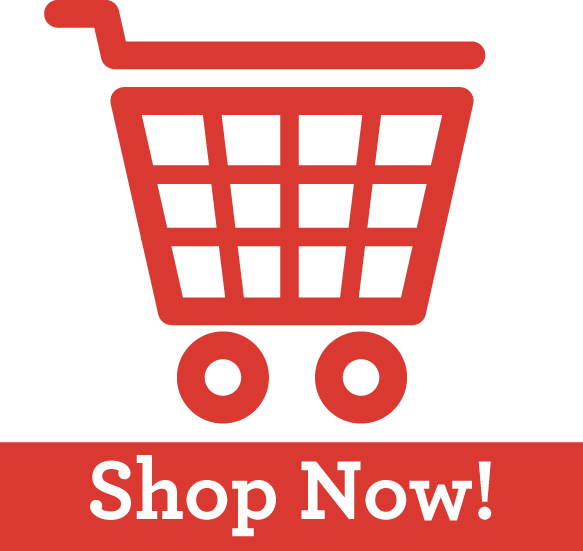 I've posted a list here, take a look and see if anything catches your eye! I will be adding to this list as I pull some of my older stamps out. Here's a photo of the fun little gift card holders I made with one of my all time favorite Big Shot dies (Two Tags) which is retiring, and one of the first stamp sets I bought as a demonstrator (Jolly Bingo Bits) which is also retiring. The "Merry Christmas" sentiment is from the set 'Teeny Tiny Wishes', which I'm glad is still around, and the paper was from last years holiday catalogue.